I am excited to be participating in this Expressions Vinyl blog hop with so many amazing bloggers. 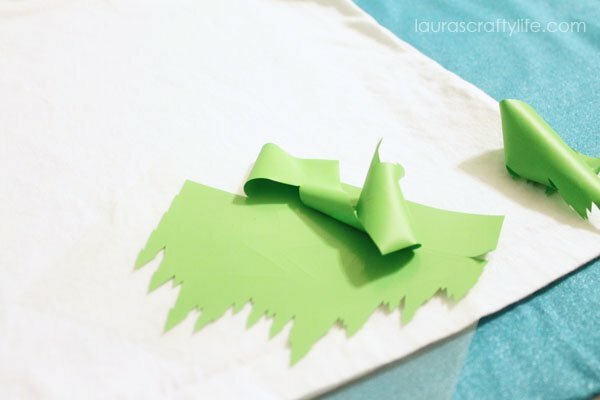 If you have ever wanted to try using vinyl but weren’t sure what to do with it, this is the post for you! There are over 50 amazing ideas for you to be inspired by. Thank you to Expressions Vinyl for providing the heat transfer vinyl for this project. Some of the links below are affiliate links, meaning, at no additional cost to you, I will earn a commission if you choose to make a purchase. I recommend them out of personal experience and I am very grateful for your support of Laura’s Crafty Life. #VinylProjects #ExpressionsVinylI wanted to make some family t-shirts for myself, my husband and my two kids. 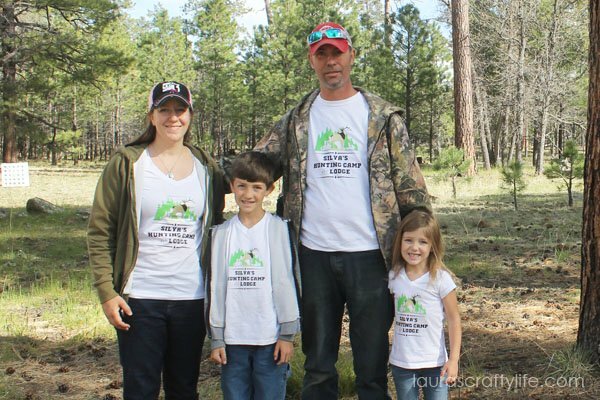 We are a camping, hunting, outdoorsy family. We love to spend time together doing things in the outdoors. I had received a post card from a t-shirt printing company with our family name and a picture of a deer that I thought was adorable. 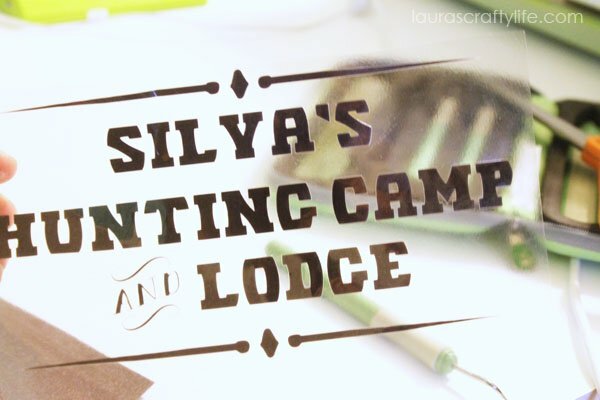 I knew I could create something similar with my Cricut and some heat transfer vinyl. 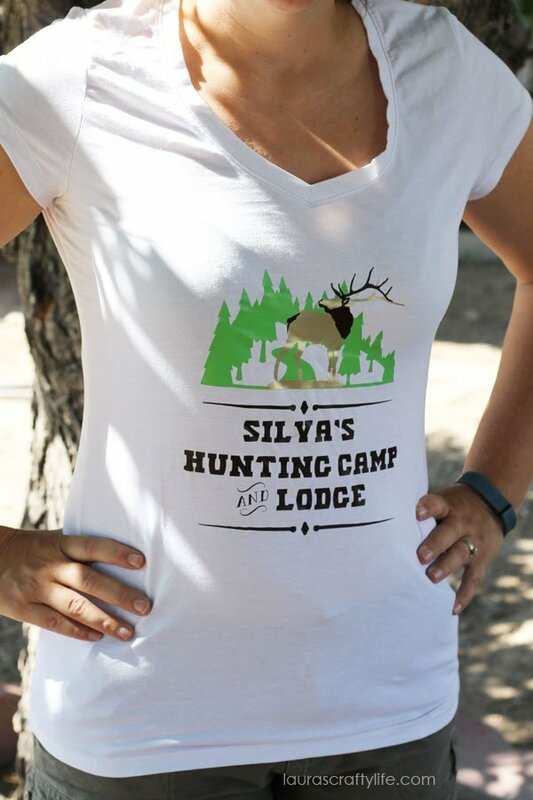 I started by designing my shirt on Cricut Design Space™. I used images from the Wildlife and Outdoor Man cartridge. The fonts are from Outdoor Man and a free font I downloaded to my computer called Bergamot Ornaments. I love using design space because you can set your canvas to anything you want. I used a t-shirt so I could easily visualize how the design would look on my shirt. Once I had everything designed in Design Space how I wanted, I cut each color of vinyl using my Cricut Explore. 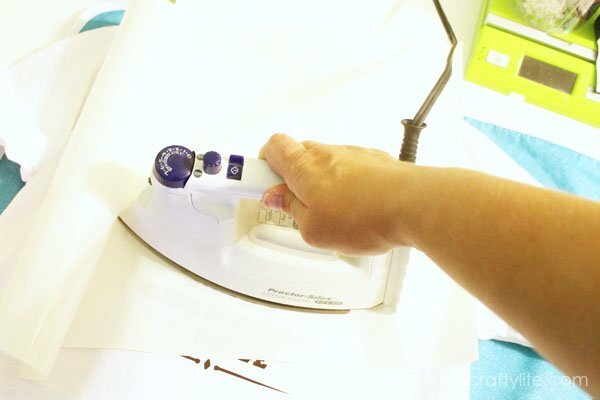 Load the shiny side of the vinyl down on your cutting mat. Set the dial to vinyl. Be sure when cutting you select “mirror image”. This will ensure your image will iron-on the same way you have it designed. If you do not choose mirror-image, your text and/or image will be backwards. The backing on the vinyl essentially becomes your transfer tape. 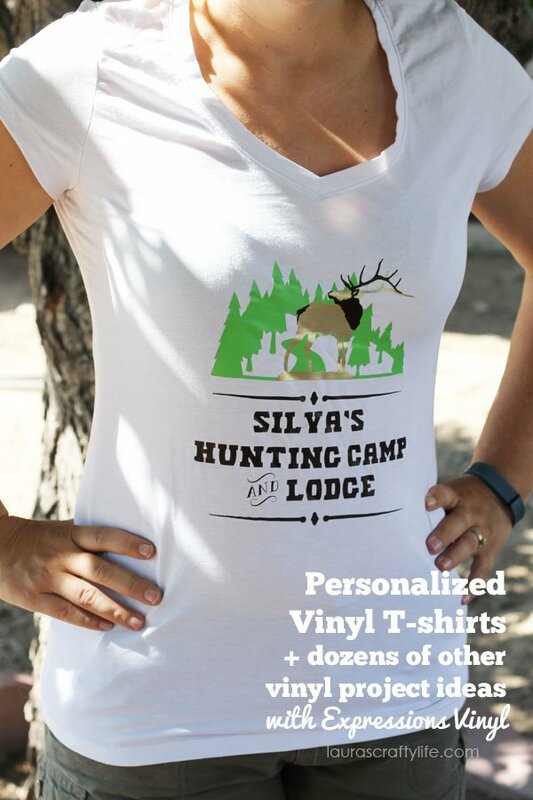 You can see in my design above, compared to the actual shirts, I forgot to choose mirror image for my trees and the elk. Luckily I caught my mistake before cutting my words on the vinyl. The main body of the elk is Vegas gold, the tree line is apple green and the details on the elk and the words are brown. Note: When designing in Cricut Design Space, be sure to choose the same colors in your layers palatte for the items you want to be the same. (For example, the words and the details on the elk.) This will ensure it all cuts on the same piece of vinyl the least amount of waste. After all the vinyl was cut out, it was time to weed the vinyl. 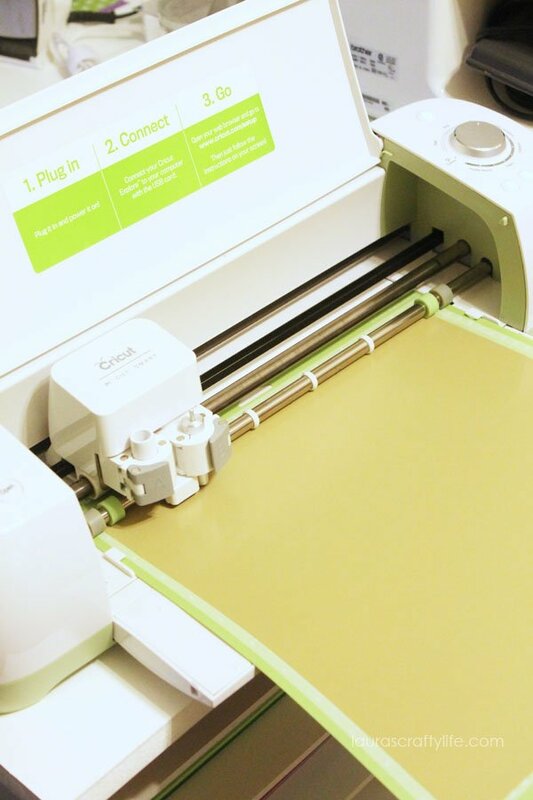 This simply means to remove all the excess vinyl on your clear carrier sheet that does not make up part of your design. To make this easier, I trimmed around each section of the vinyl that needed to be weeded. Having a weeding tool (and patience) really helps to get all the little pieces out. Below you can see the clear backing with the words for my shirt with all excess vinyl weeded out. I started by ironing on the green trees. To apply the vinyl, place your vinyl on the shirt. Applying even pressure, with the cotton (or slightly warmer) setting on your iron, begin to iron the shirt. Hold the iron in place for 10 – 15 seconds, holding down firmly and then move your iron to the next section, repeating this process. The vinyl I have can have the backing material peeled off while cool or warm. I waited about 10 seconds and then carefully removed the clear backing. Re-iron any spots that did not adhere firmly. Lastly, I ironed on the elk antlers and tail, and then the words. I repeated the same steps for each shirt. 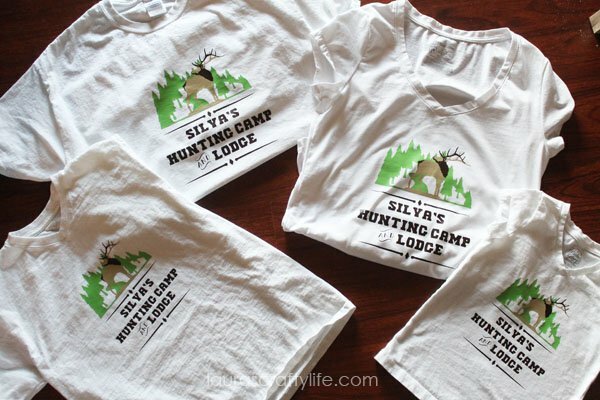 I created two cut files – one adult and one kids – so that the design for my kids shirts was smaller to fit better on their shirts. Check out all the other great projects participating in this awesome Expressions Vinyl blog hop. wow,that is a great t-shirt! It turned out amazing.